Professor Knottenbelt’s approach is clear, authoritative and based on many years experience in treating equine dermatological conditions. The book presents over 650 photographs, most of them new and unique to this edition, and the accompanying CD-ROM offers an image library with over 300 extra illustrations. The new edition is designed as a fully practical, highly illustrated guide to skin diseases in the horse. It emphasizes how to obtain an accurate differential diagnosis and arrive at correct decisions for the appropriate treatment of a condition. 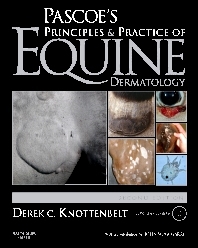 The book includes the full range of skin diseases and conditions commonly encountered in equine practice. Rarer disorders and those with a limited geographical distribution are also reviewed, and there are separate chapters on diseases of the hoof, skin wounds, neoplastic diseases and the various dermatologic syndromes that are encountered in the horse. A practical guide emphasizing how to distinguish conditions of similar appearance but different implication for diagnosis, management, and prognosis. A unique ready reckoner (key points chart) is included in each disorder to allow rapid summary information acquisition and use for practitioners and students at all levels. Offers expert guidance with algorithms for decision making and treatment choices and considers syndromes as well as the diseases involved in the differential diagnosis and investigation. Focuses on commonly encountered skin diseases but includes rarer disorders. Covers skin conditions of the horse occurring worldwide. An extensive unique section on neoplastic disease is included. Includes discussion of hoof disorders and skin wounds. Superbly illustrated with over 650 full-colour figures. Contains CD-ROM with image library offering over 300 extra illustrations.